Press the MENU button on your remote control to bring up the main menu. Select the On Demand option to access a listing of content that is available. Once you find a program you want to watch, you can view a trailer of movies (if available), view more information or rent the program. Does it cost anything to view what programs are available? No; you can browse the VOD selections for free. You are only charged if you rent a program. A confirmation screen will appear to confirm your rental. CCT’s VOD service includes a large selection of FREE programs, including kids, music and educational programming. How do I know if I will be charged to rent a program? The price of the program rental will appear above the description on the screen. The price will also appear in the confirmation screen when you rent the program. Will I be billed if I rent a program with a fee? Yes; the rental fee will appear on your monthly bill with the program title. New programs are added to the system weekly. Are any of the programs in HD (high-definition)? Yes; a selection of programs are available in HD. Select a program and in the information section it will say the title and then HD. Do any of the programs have closed captioning? Yes; some of the programs contain closed captioning. Look for the (CC) in the program description to verify if there is a closed caption option. When I rent a program, how long do I have to watch it? You typically have 24 hours to watch your rental, though some studios allow you up to 72 hours. You can watch the rented programs as many times as you would like within the allowed period. 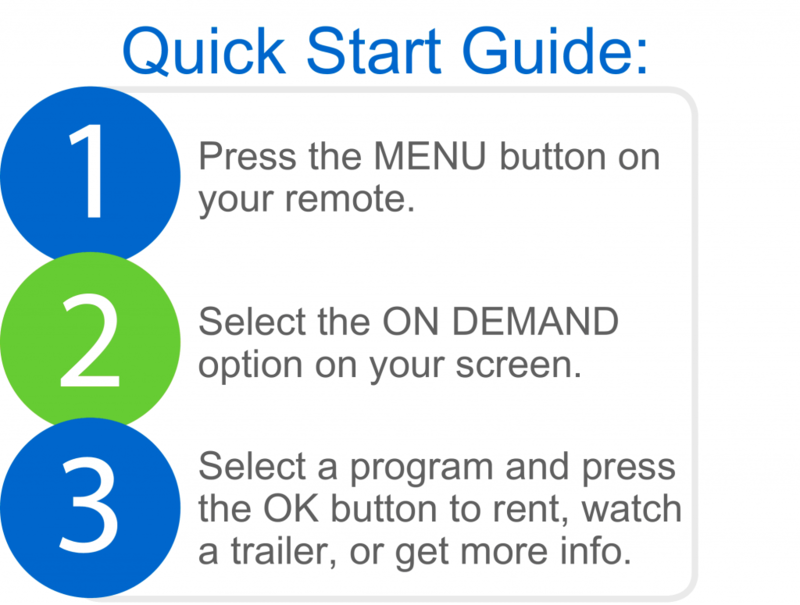 To see which programs are still available to watch, press the MENU button on the remote and choose the My Library option in the main menu and select the Videos option. Can I stop a program and watch it later? Yes; you may resume or restart your program within the allowed period. Can I pause/rewind/fast forward a VOD program? Yes; simply use the PAUSE II, PLAY >, REW <<, and FF >> buttons on your remote to control your VOD program. Can I purchase the boxing/wrestling event coming up this weekend? Yes; you can purchase boxing/wrestling events on VOD under EVENTS tab. CCT VOD rental limit is $50.00 per month, if you need this to be increased please call us at 248.2323. Can I Opt-Out of VOD service? Yes; to opt-out of VOD please call our office or click on our Opt-Out link below. Can I enable a PIN for VOD purchases? Yes; you can set up a PIN for VOD purchasing. Press MENU, select Settings, enter your password (default is 0), select Users then Edit. Enter PIN information then select Enable PIN and select Submit to save your changes. Can I enable Parental Controls to block adult content? Yes; to enable Parental Controls press MENU, select Settings and enter your password (default is 0). In Preferences, select the check box for Parental Controls. Then select Edit, change controls as needed and select Submit to save changes. Reminder: Parental controls will affect VOD and CTV programing on all CTV boxes in your home. What should I do if I’m having problems with the service? During periods of high demand, CCT’s VOD service might be unavailable for a short period of time. Please wait a few minutes and then try again. If you are still having problems, please contact CCT at (608) 248-2323.